I used to own a pretty sweet sling shot. It had a handle shaped like a pistol grip, along with a metal brace that would go over my forearm. Attached to the forks was rubber tubing and a leather pouch. I could put a lead or steal ball in that sling shot and kill an elephant (at least in my imagination). However, the sling shot that I had as a child could not compare to the ones that were used during biblical times. The one that David used against Goliath was a serious weapon which required considerable skill to use. Sure, my sling shot could kill small vermin and knock down targets at close range, but the type of slings Solomon was referring to could, and did, kill people. In Judges 20:16 we read how the Benjamites had 700 left-handed slingers who could aim at a hair and not miss. In 2 Kings 2:35 we read how that the Israelites used slings in warfare. As a matter of fact, lead shot used by the Greeks and Romans in warfare could have an effective range of over 200 yards. 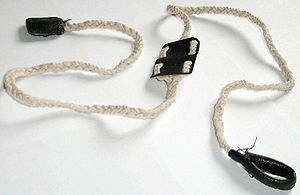 Amazingly, even though the sling was in use over 3,000 years ago, it is still being used today as a weapon by survivalists and fighters alike. It would seem that its simple construction, ease of use, low cost, unlimited availability of projectiles, and deadly potential could keep the sling in use forever. In the hands of a trained slinger, it is practically foolproof…unless you bind the stone. As good of a weapon that the sling shot is, it is worthless if the stone or shot never leaves the pouch. Sometimes a stone can fall out of the pouch by accident, but putting another one in only takes a second. But the idea of securing the stone to the sling so that it never leaves is like plugging the end of a rifle. But this is what Solomon is trying to explain. Honor, prestige, wealth, giftedness, glory: all of these things are wonderful tools which can be used to great effect by the wise man. However, when in the possession of the fool, all of these things, especially honor, are worthless. Solomon is speaking to the one who actually gives honor to a fool. The fool doesn’t posses honor on his own, but has it given to him. The warning in this verse is really aimed at the one who needs the stone thrown. Some people will honor people who don’t deserve it with promotions and bonuses, thinking that those blessings will make the fool more of an asset. The problem is that the fool will not share in the honor given, nor will he use it appropriately. Therefore, instead of being useful, the fool has now become a liability, much like a soldier who refuses to fight. Beware of political correctness. Beware of honoring for the sake of honoring. The one who truly makes honor worthless is the one who gives it to the fool in the first place. This entry was posted on Wednesday, March 22nd, 2017 at 9:28 am	and tagged with Book of Proverbs, David, Goliath, Proverbs and Sayings, Sling, sling shot, Solomon and posted in Armour and Weaponry, Fools, Giving Honor, Value and Worth. You can follow any responses to this entry through the RSS 2.0 feed.